ExcluSec provide professional and accredited Security Guards to organisations of all sizes. We’re extremely proud of our reliable, cost-effective security service and offer our clients a solution that’s tailored to meet their needs exactly. Our Manned Guarding service is available for round the clock security at business premises, construction sites and manufacturing or warehouse sites. We provide fully SIA licensed security guards to all clients and all our guards receive continuous training to ensure they are equipped to handle any kind of incident. Our knowledgeable operations team work closely with all clients to ensure that all our security guards we supply have received detailed assignment instructions and risk assessments to enable the delivery of the most effective manned guarding service. If you need a manned guarding solution to protect your business premises, assets or commercial properties, get in touch with ExcluSec today to find out all the ways we can meet your needs in full. 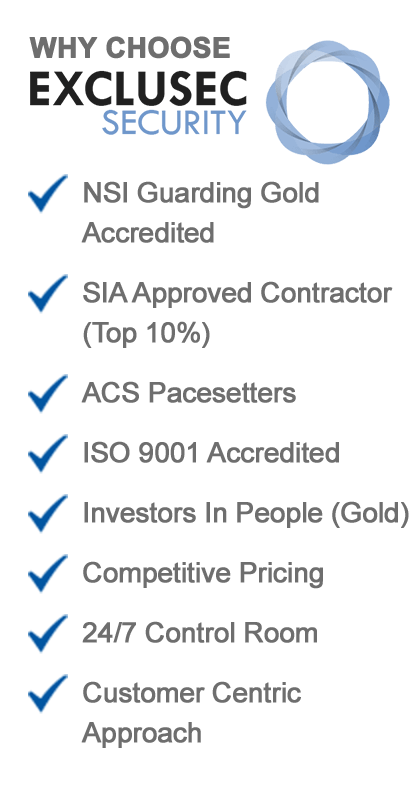 You can expect the highest possible standards from our SIA licensed security guarding personnel. We positively encourage client feedback on our security guarding services, because that way we can continually review and upgrade our service to meet the needs of the modern workplace. We endeavour to provide a security guard service that exceeds client expectations at all levels and only employ security guards after a comprehensive vetting and security checking procedure to BS7858 standards has been carried out. Our service is in full compliance with the requirements of BS7499 and all our guards are licensed by the Security Industry Authority (SIA). Our comprehensive training for security guards includes health and safety, fire safety, manual handling, emergency first aid, needles and sharps awareness and vulnerable people training. Our guards are also trained in all aspects of customer service. At the time a security guarding contract is negotiated, we’re more than happy to include a variety of additional duties, such as first aider, fire marshall or traffic warden. 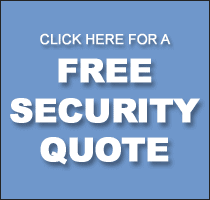 If you need immediate security guard protection, don’t hesitate to get in touch with us. 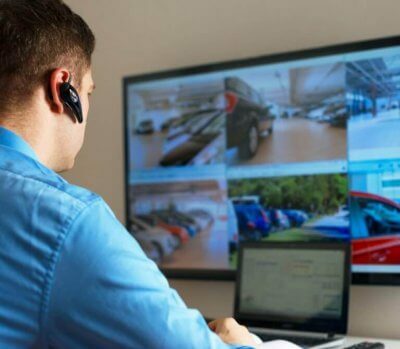 We can deploy professional, SIA security guards to your premises and provide the 24/7 surveillance and guarding that ensures your continued peace of mind. We’ll happily provide you with flexible security services for a few days or weeks, if you have received information your premises are likely to be targeted by criminals or activities likely to cause distress to employees and local communities. Get in touch with us today to talk about the security guarding solutions we offer and which have been recognised as a proven deterrent. Some of the popular locations we offer security guard services include Manchester, Trafford, Bury, Bolton, MediaCity UK, Salford, Oldham, Stockport, Wigan, Tameside, and Warrington. We also provide professional guarding to clients throughout the UK, so get in touch today to find out all the ways our site security and manned guarding can protect your premises. If you would like to discuss your Manned Guarding and Site Security requirements further, call 0333 344 3991 or submit our online enquiry form.